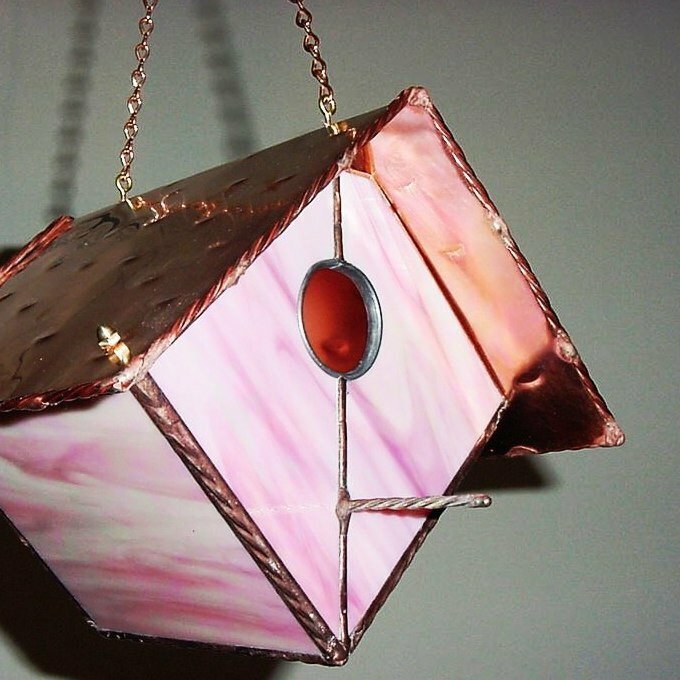 Stained Glass Bird Feeder Sale Colors! There’s some fab colors on sale, the teal house gone for good, but a few teal and dark blue stained glass bird feeders are up for grabs! 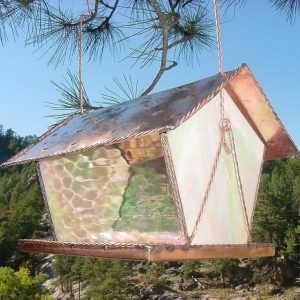 With hand hammered copper roof, these hanging feeders offer large hoppers for versatile seed options from tiny thistle to chunky mixes with peanuts, so capacity varies from 3 to 5 lbs. 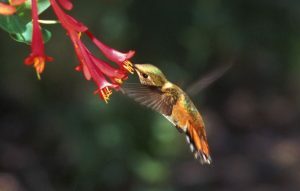 We recommend hanging the birdhouses in a shady area, or at least one that receives morning sun only. 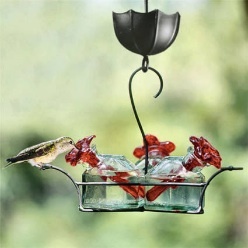 The white glass feeder is available, as is black cherry (birdhouse is shown for color reference). Non-porous, smooth surface is easier to clean and healthier for birds too, no cracks or crevices for bacteria to settle into or mold to develop. Ample drainage in copper trays helps keep seed dry. Ventilation & drainage on birdhouses keep nests and babies cozy and dry. Highly functional art for the garden, their rich color will never fade and light reflects beautifully. Squirrels can not chew them to shreds… in fact, they can’t chew the copper or glass at all! Roofs lift for easy filling & cleaning or nest removal with houses. Self hanging twisted copper chain makes them a snap to hang, from a bracket, feeder pole or branch. Simply use a clear, unobtrusive baffle if squirrels are persistent at feeders (most are). Handmade in the USA, and definitely bird-approved, they make for elaborate and stunning gifts for any occasion. 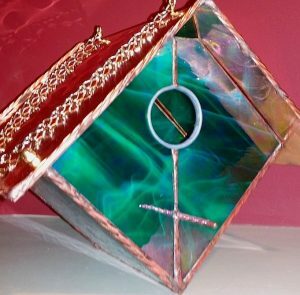 Splendid idea to nab one on sale and stash it away for an impressive holiday gift that sparkles! Ready for upload to the site and occupancy by some feathered friends… Charlie’s done good with these new (old) rustic wood birdhouses! You won’t find them on store shelves, nor online because they’re locally made and signed by the artist (who actually enjoys his own backyard birds too). 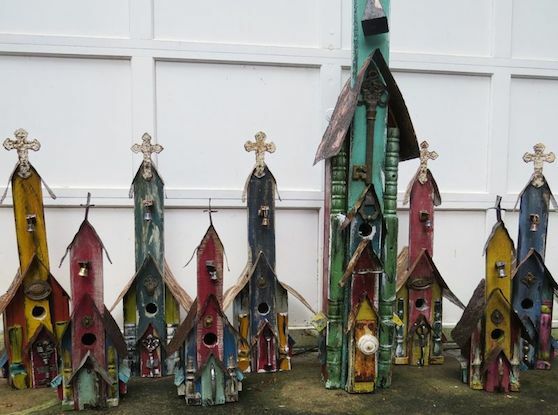 You may however find them around Atlanta as he’s been creating these unusual bird homes for the past 16 years. No plywood on these church birdhouses, the wood is truly salvage from barns and other structures around GA and NC. Clean-outs are located either on back or with removable floor. 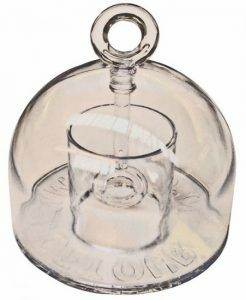 1.5-inch entry makes them ideal for bluebirds, Carolina wrens, chickadees, titmice and possibly a downy… these houses offer ideal digs to raise young. Lots of ventilation and proper drainage keep nests dry & cozy for chicks. Bluebirds may take to a 3rd brood this season in them, and others will find them an awesome roost for cold nights this coming winter. 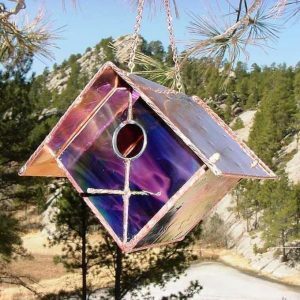 Ringing bells and re-purposed hardware, along with old world jewel tones make each bird house unique for the collector (and avid backyard birder too). Very bird-friendly, they’ll host many successful broods and fledges over the years! But it’s first come-first served as limited quantities exist. Expected for sale later this week, keep an eye out for these very functional, very unique rustic wood birdhouses!